Save lots of valuable time by managing your Magento catalog way faster, way easier and way more efficiënt. Trusted by 500+ happy customers! We absolutely recommend this extension! This extension has been added to my ‘must have’ list. 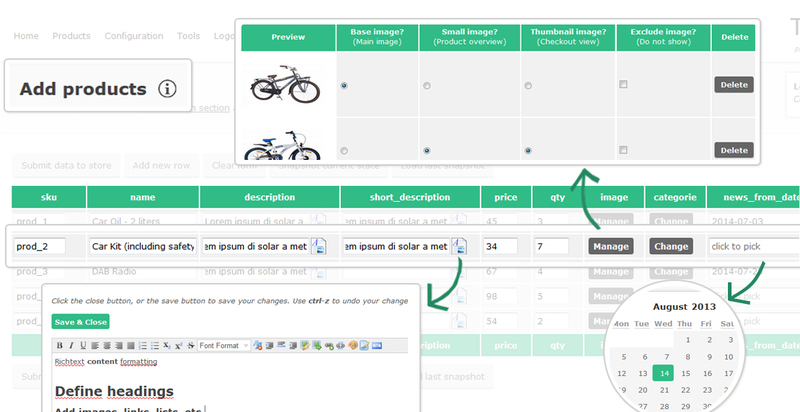 Amazing how many features this plugin has, the speed of the app and the instinctive easy way of adding products. We also love the product overview, gives us a good and quick overview of our product portfolio. Settings and forms are adjusted within seconds. Thanks! At first I was surprised to read only positive reviews of this extension. Now I understand those guys who wrote the reviews as now I’m one of them. Fantastic product and fantastic support! Thank you so much for the new release! We are already happely using Tigermin since a couple of months but we really missed a couple of features which would be a lifesaver for us. They now added one of the features we have been requesting multiple times (saving productgrid filters) and it works great. The service and tool these guys are offering is absolutely A+ , thanks guys!!!! WOW! This incredibly has speeded up our catalog management and adoption process. I love this extension, works like a charm, definitely going to recommend this! Brilliant, best extension ever and quite bizar to see how easy product management can be. Ashame that Magento did not make this easier in their core. Anyways, no brainer as for the cost comparing features to price. I have bought a lot of extensions in the last couple of years and this extension has far more to offer then competing extensions in this price range. Just bought and installed the tool. Absolutely awesome, much better and faster then alternatives I tried. Documentation is good enough, installation was fairly easy. This product is amazing! It saves us an incredible amount of time every single day and the support is crazy good. Great extension works smooth and save alot off time. This extension is excellent! Everything works perfectly! And a good style. Thank you! I am using Magento for years and I usually don`t write reviews. This extension excellent. I use it with Magento 1.7 and it works out of the box. They update regularly and the support is great. I am very happy with this extension and I do recommend this to anyone! I am very happy with this extension. good support for installation and also good code design. In my Opinion I can recommed this to every one. Using this extension to add configurable products on magento 1.6. Works like a charm and actually does save me tons of time. Now I use this I Can`t believe why Magento made it so hard to add configurable products, attribute options, etc. Thanks! I ordered this extension 2 months ago, very easy set up, regularely updates, and installation as described in the manual. We use it every day because we use magento as ERP. It is working perfect and very helpful. But the most important for me is the great support. They helped me out twice within an hour!! Works as described, thanks. Smooth and easy……. We can now easily bulk update attributes because we can make a selection in the grid filtered by any attribute, brand for example. The thumbnail in the grid makes it easier to find the right product. Updating stock right from the grid makes it easier to perform stock updates. This extension has saved us a lot of time! I have been looking for such an extension for a while and came across this one. 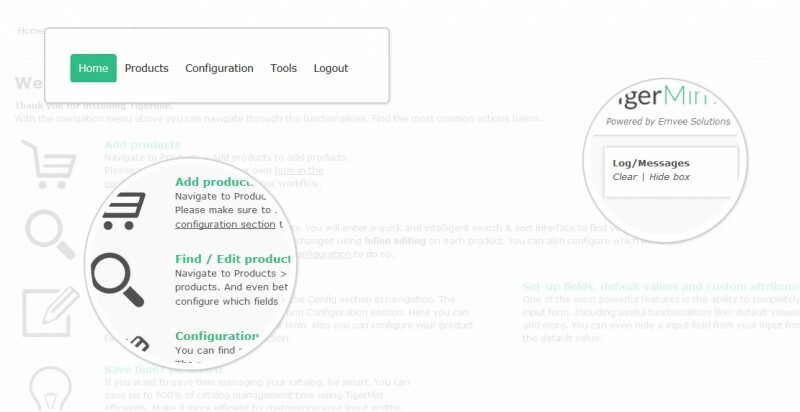 I must admit, it is everything I have been looking for and it makes managing products catalog really easy. I’m using Magento 1.9 and installation was without a problem! I added many columns to my grid, including images and attributes, and it worked as expected. I have been long awaiting the support for configurable products. After you e-mailed today that this functionality has been added I bought the extension right away. And what can I say, it works amazing! Brilliant, easy and superfast. Keep up the good work guys! WOW! Brilliant extension. After purchasing this I can say as a very satisfied customer that the extension and the developers support is absolutely great. For this price, it is a giveaway. If i`d only discovered this earlier, it does save me hours of time! The simplicity but completeness of this extension is brilliant. Thanks a lot Emvee Solutions! Great extension, easy installation. Saves us tons of time on our 5k productstore. I found a bug but they resolved it very quickly, nice work guys! Hello Thanks for your app, it speed the system up very smoothly. Customer support is good also. I have to say again due to excellent customer service, issues all be solved in minutes. I am a non-savy html, they do the rest for me, Thanks, i recommend this extension. Best Extension and also with Great support. Made my magento speedup like a rocket! I bought tigermin and I’m so suprised !!! Extension is so good ! Working even better that it should !!! It is very fast! Had some problems with the installation, but received great service. Now it works and it saves a lot of time. Better than Magento. I don’t use it very much since we already added our complete collection via Magento backend, but it works indeed way faster than Magento backend. Nice product and in the feature I will certainly make more use of this. For now it is the ideal solutions for quick stock and status changes. TigerMin is a very strong and powerful tool for managing your products. It makes lot of work in seconds, because TigerMin helps to perform tasks more efficiently. The support is great and the installation was easy. Documentation is available. Excellent for working with many products in your store. Excellent product. Works extremely well and saves us a lot of time managing our store. The best extension we ever bought for our store.